Relative Strength has been extensively researched and reported upon. Any athlete/coach who has made even a modest effort to understand what contributes to making an athlete explosive will understand the need for high relative strength levels. Despite this we sometimes encounter athletes/players who tell us that their team coaches do not want, for example, squatting of heavy weights for improvements in leg strength. This is not logical when we know that high levels of relative leg strength translates to increases in explosiveness over 8m-10m – crucial for every field/court sport..
“Relative Strength” refers to the maximum force an athlete can exert in relation to his/her own body-weight. This principle applies across all sizes and to athletes of differing body-weights. For example a 70kg athlete who squats 150kg versus a 90kg athlete who squats 170kg. Athlete 2 has a heavier squat (he has greater Absolute Strength) but he has lower relative strength level because athlete 1 is squatting over twice his body-weight (squatting 150kg at 70kg bw). If these athletes race over 10m, athlete 1 is likely to find accelerating his body-weight much less challenging because of his relatively greater leg strength. 9 out of 10 times athlete 1 will be first to 10m. The athlete with greater relative strength will also be superior in vertical jumping performance. Furthermore, increases in strength are advantageous in terms of injury prevention. Being too strong is not a common problem. 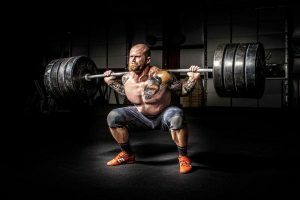 A point can arise whereby athletes/players have “enough” strength – I think in exercises like the squat that’s probably going to be somewhere close to twice body-weight – for professional field sport players like rugby, I would consider twice body-weight a minimum squat, for every position on the field. Track sprinters likewise. In my opinion a 1.5 times body-weight could be described as intermediate level, at best, for a male field sport player. The majority of the athletes we train do not have adequate leg strength levels. For that matter, they do not have sufficient overall levels of strength. It is important to develop high strength levels across the “organism” which means rear chain strength, pushing and pulling exercises as well as core strength. Just to reiterate, high levels of relative leg strength translates to improved explosiveness over 8m-10m – this is crucial for every field/court sport.. When a player is required to decelerate and/or plant his/her foot to stop or change direction, levels of eccentric leg strength are of paramount importance in enabling the absorption of force and the reusing of energy to explode away in a different direction. Just a last comment on rate of force development – as I’ve outlined, it is fundamental to athletic improvement to develop high levels of strength – it is also important to improve force creation with lighter loads, olympic lifts, jumps and plyometric training.